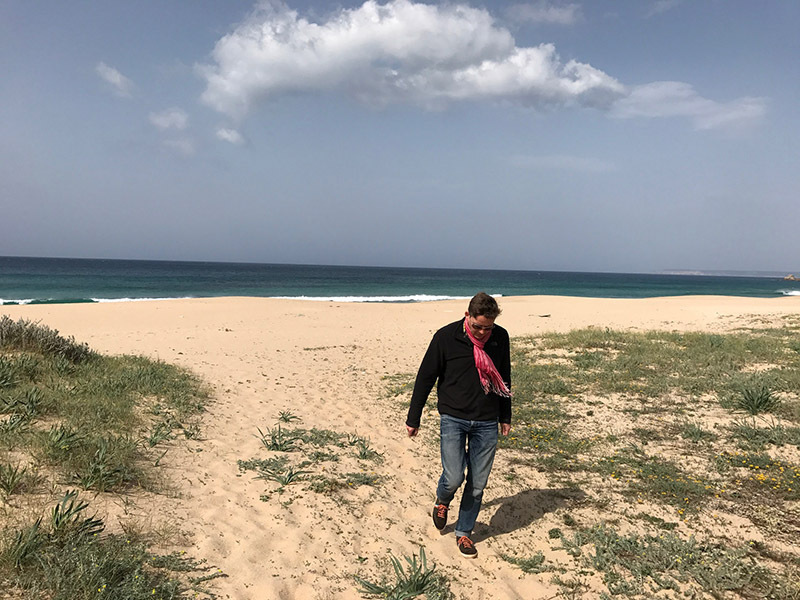 I have been along the Costa de la Luz from Tarifa to Coníl before, and it was one of the areas that I particularly wanted Andrew to see. On my previous visits, I was just stunned by the long stretches of unspoiled golden sands, extending almost as far as the eye could see, and in such stark contrast to the more developed areas along the Costa del Sol. This is the Atlantic coast, so is much wilder, and the countryside inland is much flatter - reminiscent, in parts, of the Lincolnshire fens and that unrelenting area surrounding The Wash. Both Andrew and I love the sea, and the wilder the better (unless you fancy a pleasant little swim!). When we left Cádiz, our next port of call was Vejer de la Frontera for a night before heading down to Algeciras and back inland, on our way home. 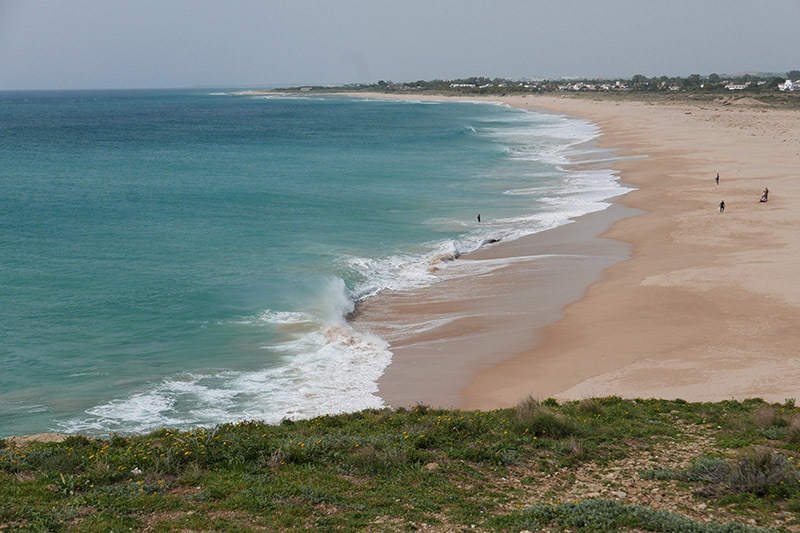 The road out of Cádiz follows the narrow spit of land that tenuously holds the old city to the mainland, and then follows the many miles of sandy coastline. There is something surreal about this drive when you reach the open countryside, as these amazing beaches are constantly there, beside you, looking (at this time of the year) as if no-one has ever set foot on the sands. There are signs of development at various points along the coast, and there is something vaguely derelict about these ‘resorts’ out of season. Many of the apartments here are for city dwellers who need to escape the ferocious heat of high summer, so they flock to the coast. A student of mine, from teaching, lives near Madrid and he rents a property on the Costa de la Luz every summer for his family, just to get away from the high temperatures inland. By his estimation, 50% of the property stock here, on the coast, is owned by Spanish nationals and the other 50% by overseas holiday home-owners. Driving along this road at this time of the year, when it is all but deserted, it is very hard to image it being crowded with people in July and August, but I have no doubt that it is. As we had left behind the edges of Cádiz, we were tempted by a sign bearing the promise of a chiringuito, so veered off the road and into a clay-red carpark from where we took a rugged path down to one portion of the coastline. To say it is magnificent is a slight understatement. There was a stiff breeze whipping spume off the crest of the waves breaking on the sands, and the colour of the water seemed to cover every range of blues, turquoises and greens in transparent glory. The fine, golden sands were traced every so often with a line of footprints - morning walkers out to enjoy this breathtaking setting. The promised chiringuito did not seem to exist, so assuming that it probably only appeared in high season, we got back in the car and headed for our lunch destination. For no other reason than I had never been there, we decided that we’d head for Los Caños de Meca, right on the shoreline, for a spot of lunch. Andrew, armed with our trusty Lonely Planet Guide, pinpointed a place called Las Dunas, with a ‘laid back, beach-shack feel’ - sounded ideal. On the way into Los Caños de Meca, you pass Cabo de Trafalgar, and I was quite keen to take a closer look, but we were both peckish, so headed into the village. Los Caños is odd. This is a BIG kite-surfing area, and the village had a faded air, and a bit too far on the side of surf-dudism for our liking! When we re-read the directions for the beach-shack, I was delighted that it actually appeared to be at the end of the little turn-off to Cabo de Trafalgar that we had passed earlier. Sure enough, at the end of the short drive, the road ended on the beach and right here sat the rather fabulous Las Dunas. It is styled to look like a thatched, beamed, ramshackle affair, but it has been developed with great care! The welcome was warm, and inside there is a lovely central open fireplace, where a few logs threw out a welcome heat. Furniture was hand-hewn from large chunks of wood, and giant pieces of driftwood formed makeshift benches. It has a lot of character, and the food was tasty and interesting - including the pulpo a la plancha that came heartily recommended by our waitress. After our lunch, we went out onto the beach. I think we both agreed that this was possibly our favourite location on our entire trip to this region. The Cabo de Trafalgar is spectacular. 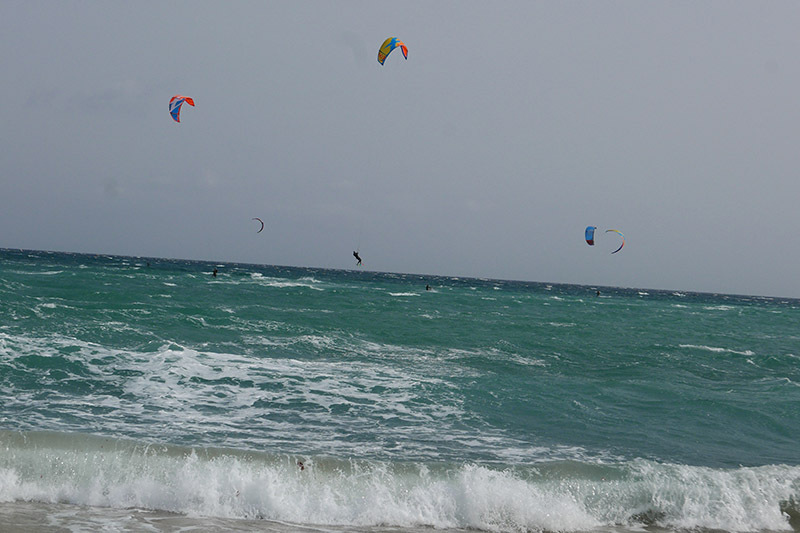 The first bay we came to was the kite-surfing spot, and it was fascinating watching the toing and froing of kite-surfers scudding across the choppy waters, often taking off and flying distances before dipping down onto the ocean once more. 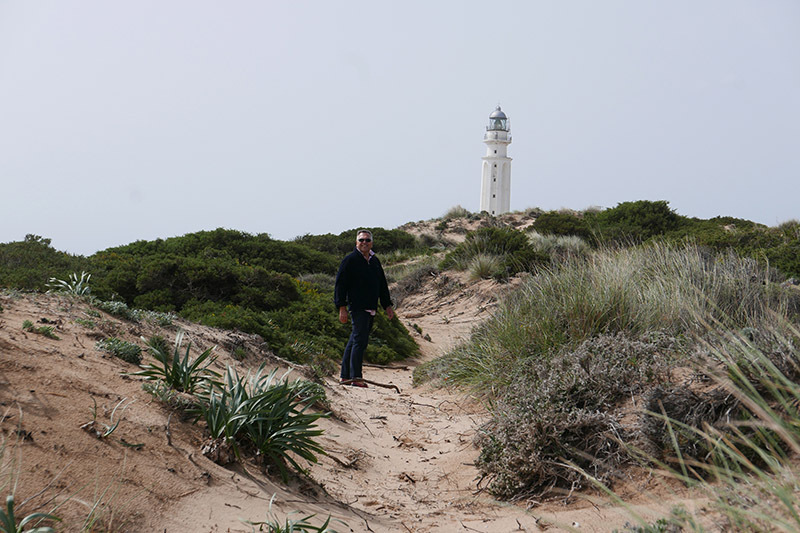 High on a crest above the beach stood El Faro de Cabo Trafalgar, surrounded by dunes and rocky outcrops against which the crystal sea crashed and folded. On the other side of the lighthouse, the extraordinary sandy coastline stretched away, seemingly for miles. This is a gorgeous spot; genuinely and naturally beautiful. It was off this section of coastline, on October 21st 1805 that the British Naval Fleet commanded by Admiral Lord Nelson defeated an enemy fleet of 33 Spanish and French ships. 22 Franco-Spanish ships were lost; no British vessels were lost, but Nelson was fatally wounded and died shortly after. I think we both could have stayed here for much longer, and will definitely be back. Again, I have no doubt that in high summer, these beaches will be filled with surfers and kite-surfers, and campers and all sorts of other people, as well as a distinct whiff of ‘herbal cigarettes’….